We are living in a new age, one in which your business success depends on access to trusted data across more systems and more users faster than ever before. At the core of this new age is Big Data, which introduces new technology, new data sources, new data types, and new possibilities for correlating information to understand more about your customers, competitors, and business operations. The problem is that this information is often incomplete, filled with errors, and beyond the reach of people who need it right away. Whether you're responsible for technology or information strategy, you need to enable your business to have real-time access to reliable information to make rapid, accurate decisions faster than competitors. Without it, your company will simply be left behind. 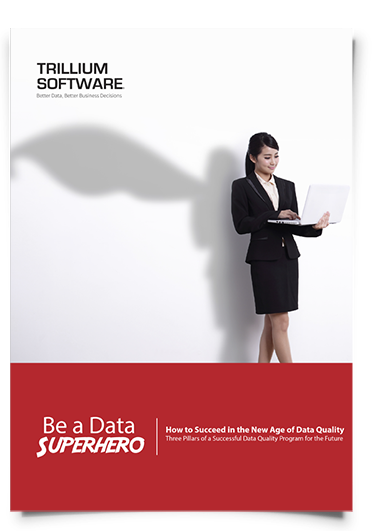 Download Trillium's new white paper, "How to Succeed in the New Age of Data Quality", to learn how you can create and implement a data quality strategy that will support your business initiatives and easily scale to meet future needs. © 2017 Trillium Software All right reserved.